When looking at an AiO, like a laptop, I think it’s a good idea to consider the display panel first. 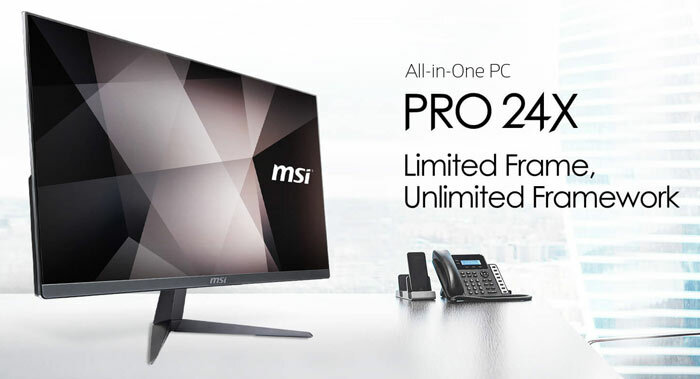 In this case MSI has equipped a 23.8-inch IPS grade panel with LED backlight. It offers the 1920x1080 pixels FHD resolution and to prevent eye strain features MSI Anti-Flicker technology. It is an anti-glare display with wide viewing angles. MSI supplies a simple, minimal stand but this AiO is VESA mountable. Furthermore, an HDMI out allows for twin-display setups. Delving inside the chassis there are CPU and storage configuration choices to be made but all the other specs are the same. The following Intel Kaby Lake CPUs can be selected; Celeron 3865U / Pentium 4415U / Core i3-7100U / Core i5-7200U. MSI's PRO 24X relies on the iGPU of the processor, namely Intel HD Graphics 620. Storage configurations are flexible. A system can include an M.2 SSD (NVMe PCIe / SATA Auto Switch) with support for Intel Optane Memory on Core i3 above processors. Furthermore, there is an easy access 2.5-inch SATA bay thanks to the 'MSI HDD Rapid Upgrade Design'. Two SO-DIMM slots are available for up to 32GB of DDR4 RAM. MSI claims its Silent Pro Cooling system is based upon a 'server grade' thermal module. From the diagrams it looks like this module covers the SSD CPU and RAM. Additionally, this module is at the top of the chassis with warm air easily able to rise away from the system. Ports available are; 2x Ethernet 10/100/1000, 4x USB 3.1 (Gen 1 Type A, one for Super Charger), 2x USB 2.0, HDMI out, audio combi jack. Other key specifications, not mentioned above are; 2 x 2.5W Speakers, Intel 3168ac Wi-Fi / Bluetooth 4.2 (optional), a 65W/90W AC adaptor depending upon model, dimensions of 538.44 x 169.96 x 399.96mm with stand, and a weight of 3.96kg. The system isn't supplied with a mouse/keyboard as they are 'optional'. Pricing and availability are not yet available. Nice to see some good options in there like IPS panel, but for productivity I would like a higher res than 1080p in 2018. I guess at least you can add a second screen but I would have liked to have seen 2 display outputs on the back of it for flexibility. Looks pretty but probably going to command a heft style premium.